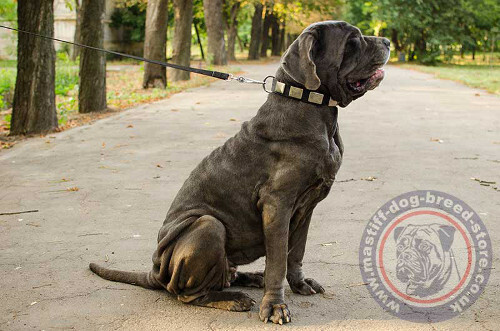 Nylon dog collars are strong dog collars with perfect fashion for big dogs of mastiff breed types! 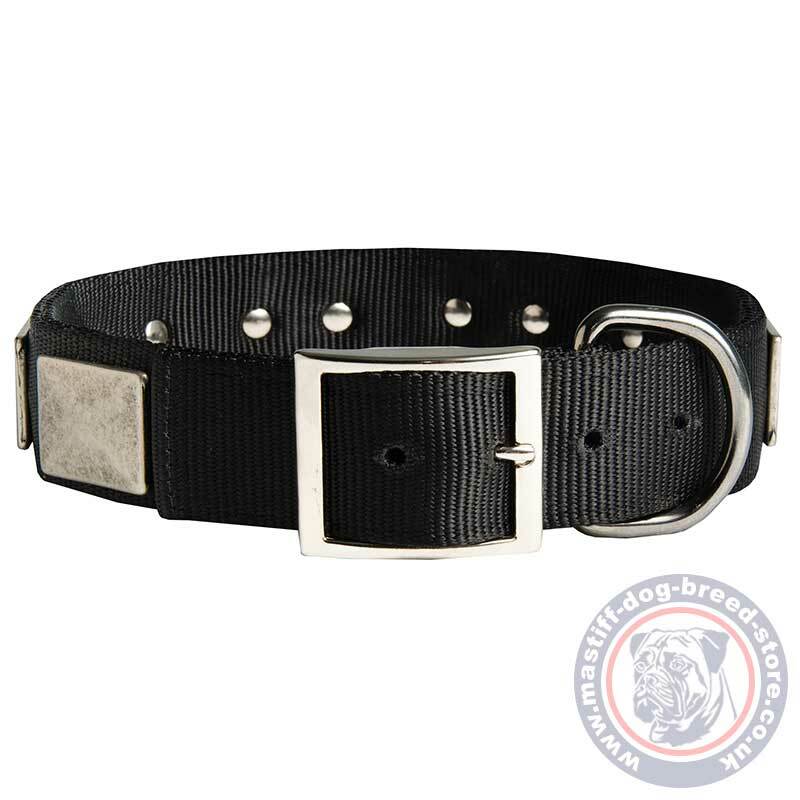 These nylon dog collars imply the best qualities of mastiff collars! What do you expect from the best dog collar for mastiff? Our professionals designed mastiff collars to be: 1) incredibly strong; 2) absolutely safe; 3) smart looking; 4) easy and comfortable. Nylon dog collars for mastiff breed types are 2 ply, surely stitched and fixed at all the details for secure and durable service daily. Nylon dog collars are simple and easy, with a classic buckle and D ring for lead adjusting. But these are also cool dog collars with elegant design! Nylon belt is studded with rectangular plates that are made in old vintage style. All the angles are safe polished and smooth. They are surely fixed by inner rivets. Each rectangular plate is fixed by 2 rivets. Strong nylon dog collars for big dogs made of nylon and decorated with chrome plated elements are multipurpose dog collars for all weather use. Nylon dog collars are easy to use, store, clean and wear. Nylon is a reliable, strong, waterproof material that does not stretch if gets wet. 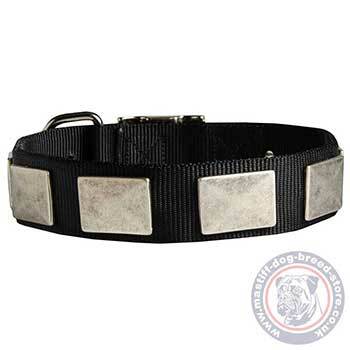 The decorations and fittings are made of rustproof chrome-plated steel, thus these mastiff collars may be used in any weather conditions. Rain is not an obstacle anymore for controlled dog walking with these nylon dog collars!